The Friends of the Sick and the Elderly in Gozo is recognised by The Commissioner for Voluntary Organisations and its Enrolment Number is VO/0066. The FSEG was a founder member of the The National Federation of NGOs of Malta, The Malta Health Network and The Gozo NGOs Association. It is the Gozo representative on the National Council for the Elderly. As a voluntary organisation, the FSEG won the "Premju San Lawrenz - 2001". The San Lawrenz Local Council awards this prize every year to the most deserving philanthropic society in the Maltese Islands. This was only the second time in six years that this prize was won by a Gozo-based society. It may be of interest to record that two members of the FSEG Committee have received national awards during the last few years for their personal qualities and philanthropic activities. FSEG Committee Member Mr. Chris Galea was selected O.A.S.I. "Zghazugh tas-Sena - 2000" (Youth of the Year). 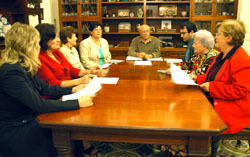 The FSEG is active together with the Ministry for Gozo, the Parliamentary Secretariat For Rights Of Persons with Disability and Active Ageing, in the provision, monitoring, control, cooking and delivery of the Meals-on-Wheels Service in Gozo, cooperating with other philanthropic societies, constituted bodies, homes for the elderly and the Gozo hospital. The attendance of members at the Annual General meeting is very important as it demonstrates their active interest, support and commitment, while it gives them the opportunity to express their views and to elect persons of their choice to the committee. The FSEG Committee meets every second Thursday of each month. The Year 2016 AGM was held on 23rd February, 2017 at the Exhibition Hall, Ministry of Gozo. The Year 2015 AGM was held on 19th February, 2016 at the Gozo Ministry. The Year 2014 AGM was held on 24th February, 2015 at the Ministry for Gozo Hall. This FSEG was inaugurated in 1988 through the amalgamation of "The Friends of the Elderly, Craig Hospital" and "The Friends of Chambrai". These voluntary groups visited and helped the patients of the geriatric wards of Craig Hospital in Victoria and those of the Psychiatric hospital in Fort Chambray. Since the name of Craig Hospital was changed to The Gozo General Hospital and the psychiatric hospital had moved from Fort Chamgrey to Xewkija and was due to be incorporated into the general hospital complex, the names of the groups became anachronistic. It was also realized that an additional voluntary group was desirable to cater for the needs of the sick in hospital that were neither elderly nor psychiatric. Thus "The Friends of Gozo Hospital" came into being. This was the new society's original name which, however, was short-lived because it was soon realized that sick and elderly persons in their own homes also needed assistance. In addition there was, at that time, a popular misconception about the role of volunteers helping a government institution. So, the name was changed to "The Friends of the Sick and the Elderly in Gozo" and the society's mission was extended to embrace the larger community. Within a few years about 600 paid-up members were recruited, this number fluctuates but continues to grow has currently stabilized at about 700. The statute documents are published in PDF format.